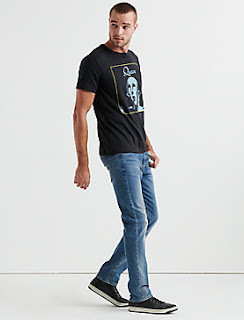 Lucky Brand announces their collaboration with Twentieth Century Fox Film and Bravado with a collection of seven vintage-inspired men's and women's Queen concert tees to celebrate the release of the new film, Bohemian Rhapsody, in theaters November 2nd, 2018. The capsule, which launches on October 4th, will include four different Queen graphics for women on t-shirts including one long sleeve, crewneck sweatshirt. Men's options will feature an additional three Queen graphics, one featuring Queen frontman and basis of the film, Freddie Mercury. Ranging from $39.50 to $79.50, the collection will be carried at select department stores including Macy's, Dillard's, Lord & Taylor and others, including specialty boutiques and online retailers such as Amazon and Zappos. The capsule will also be available at 156 Lucky Brand retail stores in the U.S. and Canada, as well as LuckyBrand.com. In support of the movie release, Lucky Brand is partnering with Bohemian Rhapsody and Queen on store window takeovers across 135 retail doors. In six top door locations, Lucky Brand windows will display iconic costume replicas as seen in the film. The costumes will be featured in an online silent auction, with all proceeds going to our charity partner Communities in Schools. In addition to the store presence, Lucky Brand will host an ultimate "We Will Rock You" Las Vegas trip sweepstakes, and feature exclusive archival Queen content as well as behind-the-scenes footage from the making of the movie. "We are thrilled to launch this capsule collection with Queen, celebrating and honoring one of the most iconic bands of all time, which launches concurrently with the release of the new film, and in partnership with FOX and Bravado. Music has always been one of the pillars of our brand and Queen is one of those bands that every generation can enjoy. The timing is perfect as we are celebrating 'Icons' within our own collection, honoring iconic pieces from Lucky Brand's history,"said Carlos Alberini, CEO of Lucky Brand. "Lucky Brand's irreverent heritage and rock & roll roots are a perfect fit for Bohemian Rhapsody and we're excited to bring the film to Lucky Brand's customer," said Chris Cerbo, Senior Vice President, Marketing Partnerships at Twentieth Century Fox. "Queen is one of the most iconic bands of all time, not only for their illustrious catalog of music, but for their seminal influence on fashion and style," said Frank Bartolotta, SVP Sales of Bravado. "We're honored to put together a program with Lucky Brand that supports Fox's Bohemian Rhapsody, a film that celebrates this incredible band and the impact they had, and continue to have on culture around the world." 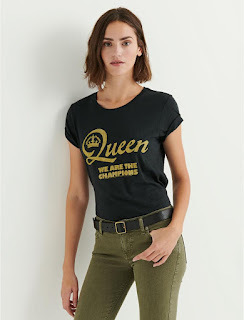 The collection solidifies Lucky Brand's connection to music by honoring a legendary artist and giving new fans the opportunity to carry on Queen and Freddie Mercury's legacy. Learn more about men's Lucky Brand fashion. Learn more about the women's Lucky Brand fashion. Staying true to the rich heritage-and authentic, all-American spirit-of denim, Lucky Brand began crafting great-fitting, vintage-inspired jeans in Los Angeles in 1990. Their distinctively Lucky look was achieved by literally putting them through the wringer-ripping, fraying, sanding, patching, and washing by hand-to give them true character and soul. Authentic hardware, personalized touches and playful details were all added, and an American legend was born. Lucky Brand jeans are made for the free-thinker, the artist, the dreamer. They're made to dance, work, run, jump, and play (just like you). Inspiration doesn't just come from the rugged workwear of denim pioneers, but from the free spirit and laidback lifestyle of Lucky Brand's Southern California roots. There are presently over 250 locations in North America, 15 of those in Canada (with plans to open three new stores in 2018). 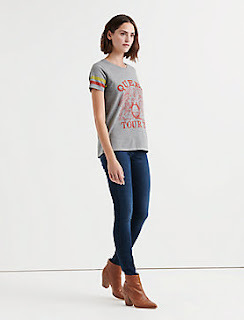 For more information please visit LuckyBrand.com. One of the world's largest producers and distributors of motion pictures, Twentieth Century Fox Film produces, acquires and distributes motion pictures throughout the world. These motion pictures are produced or acquired by the following units of Twentieth Century Fox Film: Twentieth Century Fox, Fox 2000 Pictures, Fox Searchlight Pictures, Twentieth Century Fox Animation and Fox Family. Bohemian Rhapsody is a foot-stomping celebration of Queen, their music and their extraordinary leadsinger Freddie Mercury. Freddie defied stereotypes and shattered convention to become one of the most beloved entertainers on the planet. The film traces the meteoric rise of the band through their iconic songs and revolutionary sound. They reach unparalleled success, but in an unexpected turn Freddie, surrounded by darker influences, shuns Queen in pursuit of his solo career. Having suffered greatly without the collaboration of Queen, Freddie manages to reunite with his bandmates just in time for Live Aid. Despite being diagnosed with AIDS, Freddie leads the band in one of the greatest performances in the history of rock music. Queen cements a legacy that continues to inspire outsiders, dreamers and music lovers to this day. Twentieth Century Fox and Regency Enterprises present Bohemian Rhapsody in theaters November 2nd 2018. 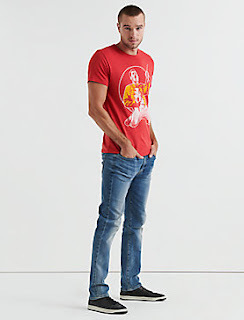 You may also have interest in learning about the Lucky Brand collaboration with the Rolling Stones. Learn more about Lucky Brand.